Barber Stop is a fully-functional, single-chair barber shop. It is designed to be operated inside the walls of a host company's high-traffic location. Its small, eight foot diameter footprint and self-contained plumbing system lets you place (and replace) Barber Stop practically anywhere you can find a 110-volt power outlet. Location. Location. Location. That's the big idea. Imagine how much more successful your shop would be if YOU were located inside a busy host location. Good barbers generate a great deal of foot traffic each year. That foot traffic has value to the host that can be traded for some portion of the rent a barber might otherwise pay. In fact, three parties benefit when a Barber Stop shop operates inside a host location; The barber, the Host company and the shoppers. Barbers gain tremendous visibility, credibility and dramatically higher sales when operating inside the walls of a high-traffic location. Here is the best part. They do it at a fraction of the cost of owning and operating a traditional brick and mortar shop. A smart host company knows the value of a person walking into their store. They also know that the longer a shopper stays in the store, the more they are likely to spend. This is a basic Retail 101 kind of fact. 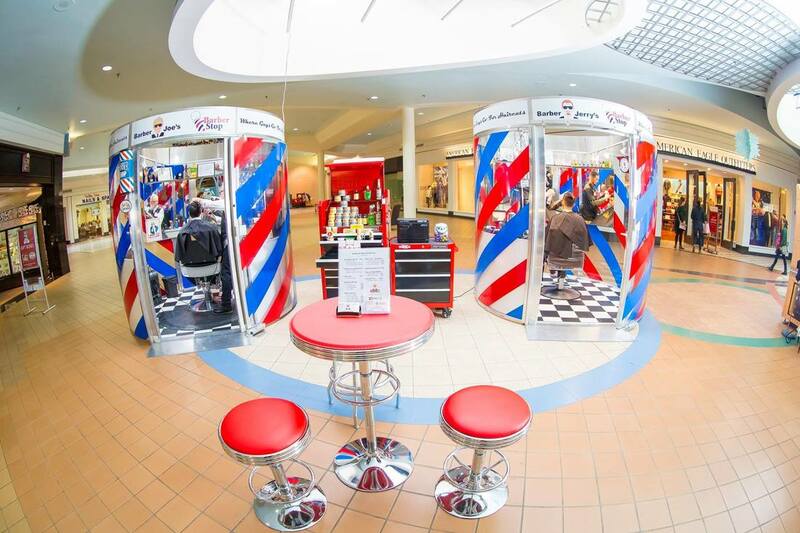 Barber Stop keeps shoppers inside a host company longer. Customers get more convenient access to great hair cuts and shaves because barbers are located in the same places they already shop and do business. Barber Stop is 8' tall and 8' in diameter. It is designed to look like a barber pole complete with red and blue stripes. The walls are made of thick Polycarbonate so those walking by can see what is happening inside the shop yet still provide some privacy for your customers. The attractive barber pole design is instantly recognizable. Even at a distance, people that have never seen a Barber Stop seem to know instinctively what it is and what it is used for. Their suspicions are confirmed upon closer inspection. Yes. It really is a barber shop with someone seated inside getting a haircut. Great barbers inside America's favorite locations!